Blanchard grinding is perfect for achieving precision sizes, flatness and parallelism on plates, bars and fabrications. 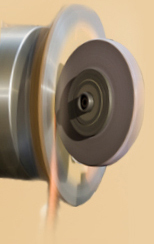 Often called "Abrasive Machining", this grinding method is capable of extremely high stock removal rates. We have eight machines ranging in size with a capacity of up to 135" diagonal and 20,000 pounds weight. Our Mattison has a 110" diameter table with 200 HP spindle motor and is the largest in northern California. 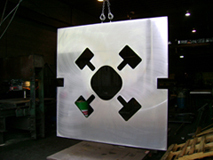 We maintain an extensive inventory of abrasives to provide for grinding almost any material and our collection of fixtures, angle plates, clamps and tooling can accommodate even the largest parts. Finishes and dimensional tolerances are of course determined by the material, thickness and size of the part, so an inquiry with the specifics will always be necessary. You can be sure that we are capable of the closest tolerances in the industry.